Joy to the World. Carol of the Bells. I Wonder as I Wander. Whence is that goodly fragrance?. Masters in this Hall. The First Noël. Pat-a-pan. What shall we give to the babe in the manger?. One December Bright and Clear. Fantasy on 'What Child is this?'. Hark! The Herald Angels Sing. Jesus, Jesus rest your head. Angels from the Realms of Glory. Silent Night. Mormon Tabernacle Choir; Orchestra at Temple Square/Craig Jessop. The Mormon Tabernacle Choir enjoys a worldwide reputation. It comes from a long tradition (it was formed in 1847) and has made over twenty seasonally-oriented albums. 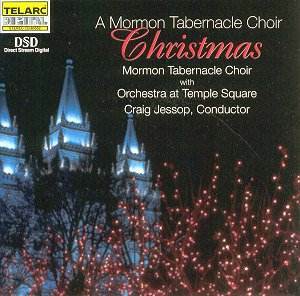 It is joined in this recording by the Orchestra at Temple Square, an ensemble (in contrast) formed as recently as summer 1999 and one which seems well suited to the choir. It has a big, middle-of-the road sound and plays the many arrangements on this disc zealously. Mark Wilburg's arrangement of Joy to the World is an appropriately big, impressive opener, but it is left to Carol of the Bells to demonstrate just how cleanly together this choir can be. The overall smoothness of the arrangements used, however, mean that unless you are prepared for this approach it can easily pall. Whence is that goodly fragrance is as smooth as an ice-rink, for example, and it is left to the more robust Masters in this Hall and the refreshingly dissonant opening of Fantasy on What Child is this to provide necessary cleansing of the palette. The arrangement of The First Noël uses an unashamedly pop-music modulation towards the end, but apart from this it walks the fine line between the touching and the kitsch well. Of all the vocal contributions, only Diana Walker's wobbly soprano in Angels from the Realms of Glory disappoints. The recording, made in March this year in the Mormon Tabernacle in Salt Lake City, is clean and crisp as Christmas snow. Teldec saw fit not to end with a crass arrangement and instead a reposeful Silent Night brings the disc to a heart-warming close. All in all, great fun. It is remarkably easy to get into the spirit of it all.